We have always had a real tree for Christmas (except the one year with no tree, which I will not delve into due the embarrassment of how we actually didn't miss it; probably because we weren't home all Christmas). This was only the second time though that we got it ourselves from the forest. With wonderful roads to support our endeavours and an awesome weather forecast for the day, my tender heart was put totally at ease. Our little girl LOVED playing and eating the fresh snow (I'm still trying to teach her about dirty snow versus clean snow). And we got our annual Christmas card send out photo completed there. 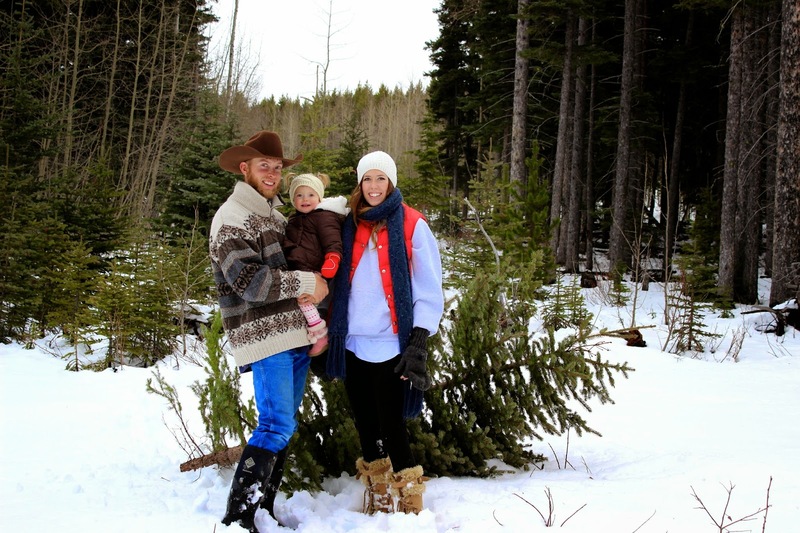 It was so nice to just be in the mountains and waltz through the snow hunting for a Christmas tree. The fresh air seems to due wonders for one's spirit, especially if you get to share the moment with 2 of your most favourite people in the entire world. Hope you all get to enjoy the wondrous blessings in your life through this Christmas season.